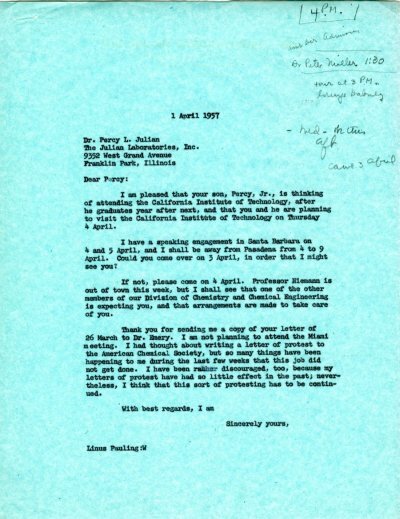 I am pleased that your son, Percy, Jr., is thinking of attending the California Institute of Technology, after he graduates year after next, and that you and he are planning to visit the California Institute of Technology on Thursday 4 April. I have a speaking engagement in Santa Barbara on 4 and 5 April, and I shall be away from Pasadena from 4 to 9 April. Could you come over on 3 April, in order that I might see you? If not, please come on 4 April. Professor Niemann is out of town this week, but I shall see that one of the other members of our Division of Chemistry and Chemical Engineering is expecting you, and that arrangements are made to take care of you. Thank you for sending me a copy of your letter of 26 March to Dr. Emery. I am not planning to attend the Miami meeting. I had thought about writing a letter of protest to the American Chemical Society, but so many things have been happening to me during the last few weeks that this job did not get done. I have been rather discouraged, too, because my letters of protest have had so little effect in the past; nevertheless, I think that this sort of protesting has to be continued. Non-Pauling Reprint: "Twenty-Parameter Eigenfunctions and Energy Values of the Ground States of He and He-Like Ions." J.F. Hart & G. Harzberg. The Physical Review, Vol. 106, No. 1, 79-82, April 1, 1957.